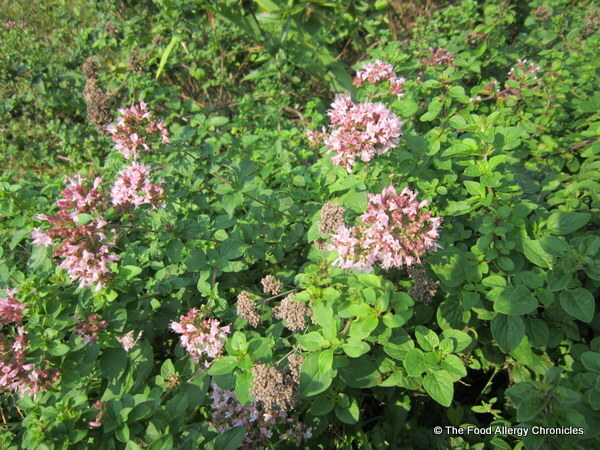 Posted on September 21, 2012 by Susan H.
Oregano has basically taken over my garden…I think it is a weed in disguise as a tasty herb! Andy literally ‘rips it out’ at the end of each season…only to see it over populate our garden once again. To make matters worse…it can even be seen growing in the grass. The horror! Personally, I love fresh oregano…therefore, Andy reluctantly leaves ‘bits of oregano’ for me…knowing full well, those ‘bits of oregano’ will more than likely, run rampant once again. Such is the ‘circle of life of our oregano’ dilemma! Andy was more than pleased that I had decided to include oregano in my harvesting of garden herbs. I can only imagine what Andy thought of this ‘piddly’ amount that I picked…rest assured, dear, I think I will be back out in the garden soon, expanding my Dairy and Peanut/Tree Nut Free Oregano Pesto. Update: Since writing this, I have just discovered he has already been at it! Aaagh! 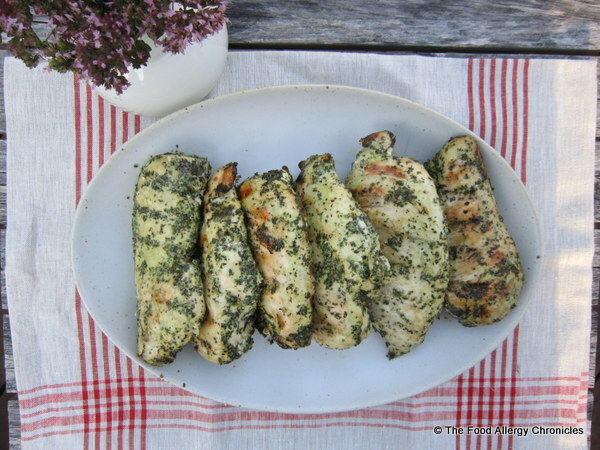 Dairy and Peanut/Tree Nut Free Oregano Pesto would be equally lovely over pasta or potatoes…as I have already presented Dairy and Peanut/Tree Nut Free Basil Pesto with Spaghetinni, and Dairy and Peanut/Tree Nut Free Parsley and Chive Pesto Potatoes…I chose to marinate chicken breasts. 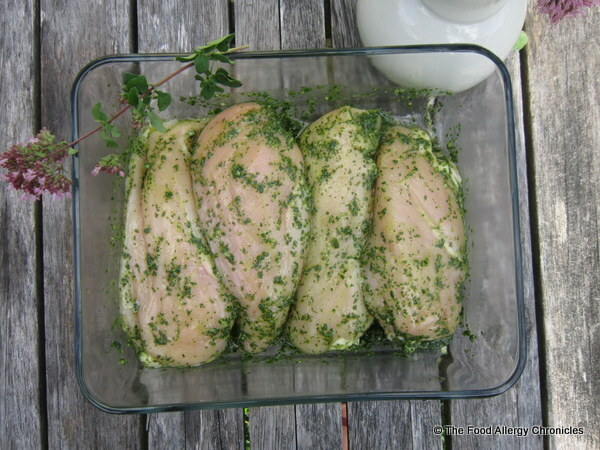 I covered boneless, skinless chicken breasts in the Dairy and Peanut/Tree Nut Free Oregano Pesto and let them rest over night. I barbecued them on medium heat, turning every 5 minutes for approximately 15-20 minutes depending on thickness. Delicious! A hit with all the boys…even Matthew! 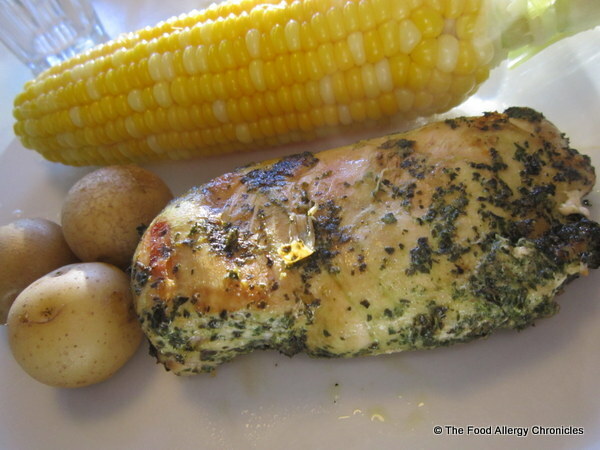 With a look of disgust on his face, his first words upon seeing the chicken…”Are there any plain ones?” Despite all the green…he enjoyed the chicken without scraping off any of the ‘green stuff’. Measure above ingredients (except oil) into a food processor. Pulse a few times to blend. While the food processor is running, slowly pour the extra virgin olive oil in. Stop to scrape down the sides and continue to run the food processor until a smooth consistency is obtained. Andy enjoyed his with some of the leftover Dairy and Peanut/Tree Nut Free Potato Salad and Michael warmed up some of the Dairy and Peanut/Tree Nut Free Basil Pesto Spaghetinni. I had a little of everything. 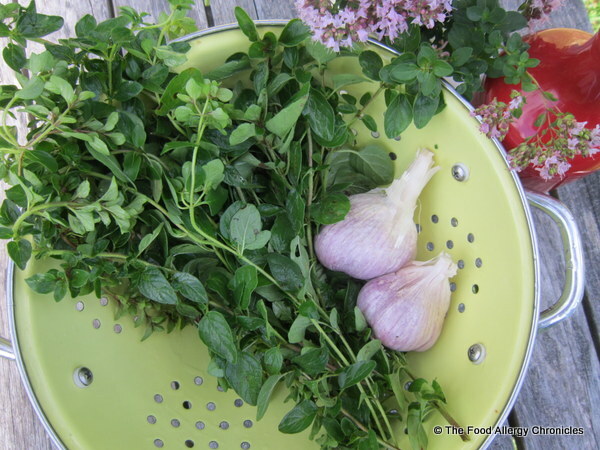 I really had fun infusing all the individual flavours from my herb garden with simple ingredients like pasta, potatoes and chicken…turning the plain into something wonderful! Question: What fun flavours have you created this summer/fall from your garden or local farmer’s market? 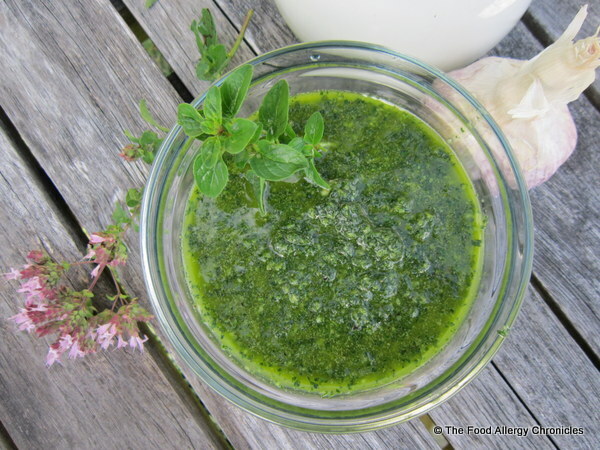 This entry was posted in dairy free, dinner, lunch, multiple food allergies, peanut/tree nut free and tagged Dairy and Peanut/Tree Nut Free Oregano Pesto, Dairy and Peanut/Tree Nut Free Pestos by Susan H.. Bookmark the permalink. Thank you! Dairy and Peanut/Tree Nut Free Pestos really do liven up a dish! Oh that look absolutely delicious, Susan!! Yum! So healthy too! Thanks Carla! Can’t wait to defrost some in the winter when it is cold and blustery outside for a quick ‘hit of summer’ flavour!